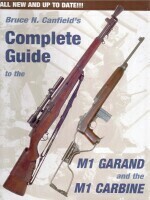 There is no single book that covers everything M1 Carbine. Which book is "best" depends on what you want to know. Each book has something the others do not. 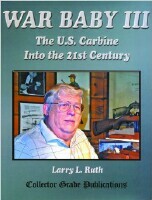 Many U.S. Carbine enthusiasts own many of these books. Serious collectors often have them all. Each author wrote based on their own experiences and opinions during their period in time. Time tends to reveal information that was not available prior, change how people remember information and take information that will never be available again. Given the breadth, depth and volume of information regarding the U.S. .30 Caliber Carbines some authors know some things, others know other things, none know all things. Authors are human. The greater the detail a book covers the more likely there will be a number of mistakes. Regarding prices, it is strongly recommended you shop around for the best price. Especially on the more expensive books. A few of these books are hard to find, a few are outrageously priced by some sellers. Focus: Basic background on U.S. Carbines. 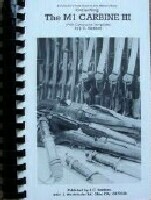 Includes critique by Ordnance Major of weapons used during the Korean War. Focus: A very basic guide with very basic information on disassembling and reassembling carbines. Better publications are available. Focus: The first book authored by a collector. Focus: Written with the intent of taking it with you to gun shows as a field reference book on everything M1 Carbine. Focus: Intended as a significant reference book built on the work of Harrison (above). Heavily illustrated with photographs but part markings shown in this book have been the subject of criticism from experienced collectors who have questioned the authenticity of many of the markings depicted. 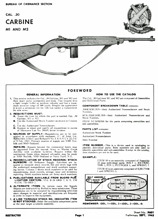 Focus: A counter-culture book on select fire conversions of the M1 Carbines. Most info is off topic and unrelated to the M2 Carbines. 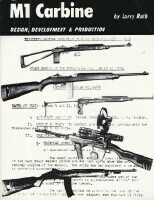 Focus: One of the first books and intended for reference use at gun shows. Focus: A counter-culture book on both original and commercial copies of the M1 Carbine. The M1 Carbine: The Weapon that Changed the Rules for Weapons Making! Focus: One in a series of short books with general information on military firearms. Focus: One in a series of books with general information on military firearms. Focus: A collection of over 100 photographs from the National Archives of U.S. Carbines being used by American soldiers during WWII, Korea, and Vietnam. 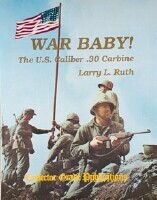 Focus: Predecessor to the War Baby series (see below). Focus: Very basic overview of topics. Focus: A history of the S.E. Overton company relative to their production of stocks and handguards for the U.S. Carbines (subcontracted by Inland Manufacturing). Focus: A detailed look at the carbine part by part from the perspective of a gunsmith. Focus: Collection of U.S. Carbine articles from past issues of The American Rifleman. Focus: Restoration to "factory original". This book has set the standard most use for identifying part variations. The author neglects to mention the value of certain carbines in "as is" condition may be far greater than a restoration if their history adds to their value. Focus: Compilation of early Ordnance documents on the development of what became the U.S. Carbine. 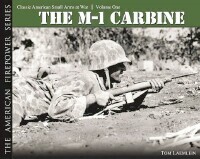 Focus: 1st volume of what has become the definitive indepth history of the U.S. Carbines. 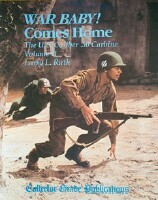 Volume I covers the beginning through the end of WWII. Heavily illustrated. Focus: Picks up where it's predecessor left off covering the post WWII years through the 1980's and into the 1990's. Includes commercially produced parts and replicas. Focus: Intended as an update that includes corrections and additions discovered since the 1990's when volumes I & II were published. Not intended as a stand alone book. For those with volumes I and/or II it completes the set with the latest information. Heavily illustrated. Focus: An overview of the U.S. Carbines with info on use by other nations. In German. that some sellers do not indicate if the copies they offer are original or reprints. Field Manuals constitute the primary means of promulgating the basic doctrines of military training and operations. They contain training instructions relative to tactics and technique. 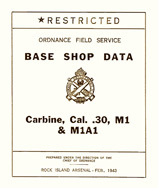 Those beginning with the number 23 contained subject material relative to Basic Weapons, including their accessories and ammunition. 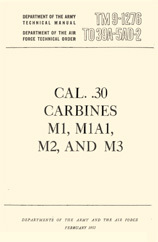 The basic U.S. Army Field Manual for the Model M1 Carbine. 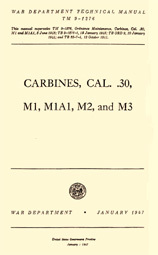 Basic U.S. Army Field Manual for the Models M1 and M1A1 Carbines. 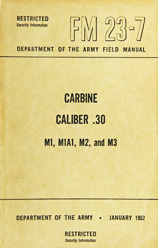 Basic U.S. Army Field Manual for the Models M1, M1A1, M2 and M3 Carbines. 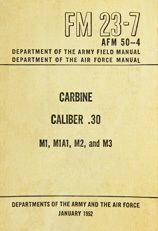 Basic U.S. Army & U.S. Air Force Field Manual for the Models M1, M1A1, M2 and M3 Carbines. 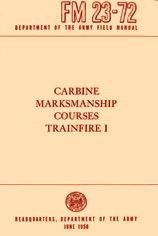 Instructors manual for training carbine marksmanship. 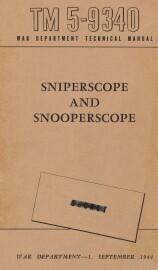 The purpose of Technical Bulletins was too disseminate new instructions and information prepared by technical services pertaining to technical matters concerning weapons and equipment procured and issued by the preparing agency, or to professional technique over which the preparing agency has exclusive jurisdiction. The purpose was also to publish, without delay, technical material that may later be incorporated in manuals or changes to manuals. 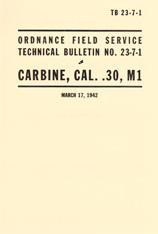 Technical bulletins do not contain material pertaining to tactical training or tactical operations. Those with a number following the letters TB identify the manual to which it applied followed by a number indicating the order in which they were released. 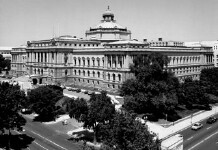 TB 23-7-1 was the first to apply to FM 23-7. Those TB was followed by the letters ORD were related to Ordnance material and did not pertain to any preceding manual. The number that followed was the sequence in which these were released. Technical Manuals supplement Field Manuals, covering subjects the separate treatment of which is considered essential to a full accomplishment of the training prescribed in the Field Manuals. 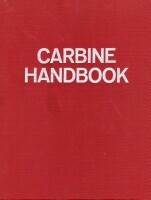 This series includes manuals describing materiel and containing instructions for its operation, care, and handling; guidebooks for instructors and specialists: material for extension courses; reference books; administrative materials; and similar specialized subject matter. Those preceded by the number 5 contained subject matter pertaining to Engineers. Those preceded by the number 9 contained subject matter pertaining to Ordnance. 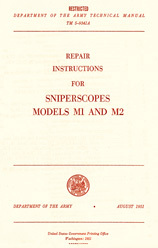 Operation and instruction manual for the infrared Sniperscope (Model M1) and Snooperscope. 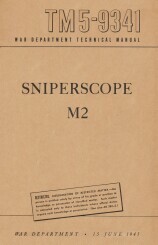 Operation and instruction manual for the M2 infrared sniperscope. 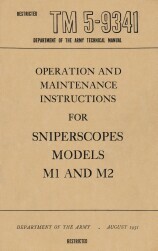 Updated operation and instruction manual for the M1 & M2 infrared sniperscope. 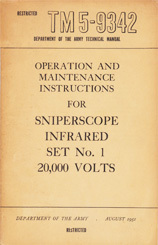 Operation and instruction manual for the 20,000 volt infrared sniperscope set. 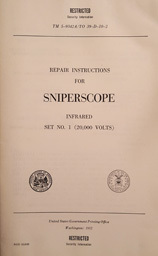 U.S. Army and U.S. Air Force repair manual for the 20,000 volt infrared sniperscope set. 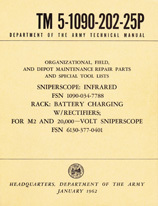 Ordnance List of Parts and Tools for field and depot level maintenance of the sniperscope battery racks. 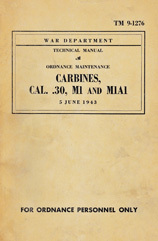 Manual used for Ordnance depot inspections of the M1 and M2 carbines. 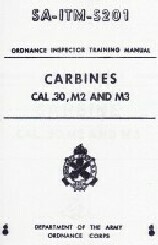 Updated manual used for Ordnance depot inspections of the M1 and M2 carbines. 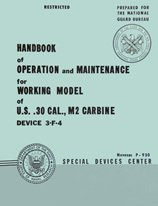 Training manual for Ordnance personnel on inspection, cleaning, disassembly/assembly, repair, and updating of the U.S. Carbines. 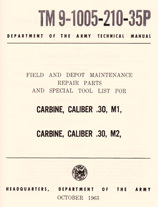 Updated training manual for Ordnance personnel on inspection, cleaning, disassembly/assembly, repair, and rebuilding of the U.S. Carbines to meet the updated standards after WWII. 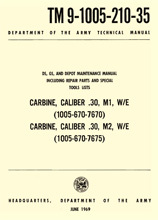 Army Ordnance Technical Manual and Air Force Technical Order for inspection, repair and rebuild of the U.S. Carbines. 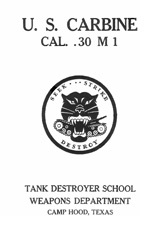 This massive book is the U.S. Army Ordnance training manual for their own inspectors. 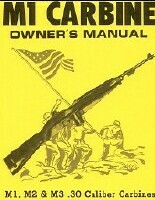 It is the most in-depth manual yet found on the U.S. Carbines. 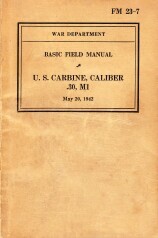 One of the first Army Training Manuals for the U.S. Carbine circa 1942. Very basic. 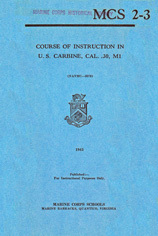 USMC instructional outline and lesson plan for a 4 hour basic course on the U.S. Carbine. 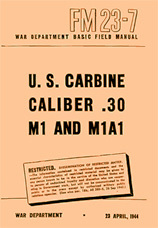 Range score book for the M1 Rifle and Carbines. One revision in an ongoing evolution of the same score book. Prior versions include NAVMC 42 DP. 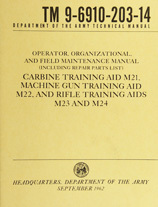 Operation and maintenance of the enlarged training aid of the M2 Carbine.